Birches are turning green. The ultimate sign of spring for me! Some are already very green, other types of birches are only getting there, some aren't even remotely green yet. The birches in our neighbor's yard are of the first type, those two latter ones can be found in our yard. In our yard, the flowers continue to bloom, tulips are the size of tea cups, and the apple trees are pushing out green and the surprise-berry-bushes have leaves. 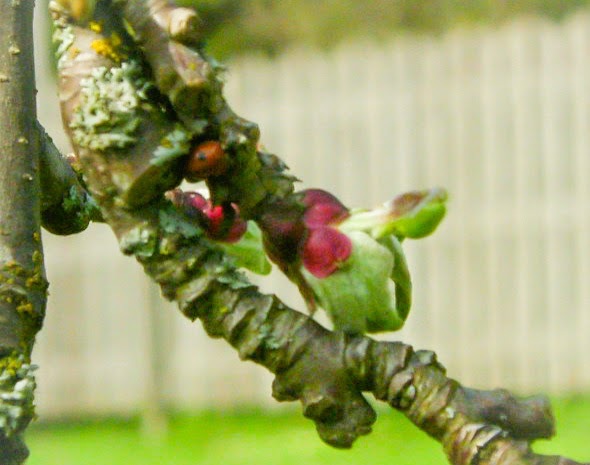 I found a ladybug snuggled in the nook of a twig on the other tree. A couple of pheasants came for a visit. Our little starts of a garden have started to sprout, at least some of the stuff we planted. Broccoli, sunflowers, radishes, a cucumber or two, marigolds, chives at least. The nights have still been too cold for basil, parsley, dill, peppers et al. We live inside the city limits of Helsinki, but we really don't live IN the CITY. I'm loving it!